"There were a number of things that people were ready to jettison because these were different times. But that's a dangerous thing because then you can always have the excuse to jettison the law, the procedures, the due process, the (Geneva) Conventions, whatever you want, when it's convenient." 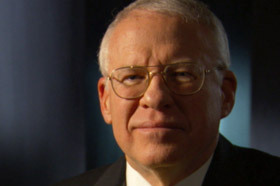 Major General Thomas Romig served from 2001 until 2005 as the Judge Advocate General of the United States Army. During 34 years of military service, General Romig has been a military intelligence officer, chief legal officer for Army forces in Europe and the Balkans, and chief of Army civil law and litigation. In 2003, he joined other JAGs in opposing the introduction of harsh interrogation techniques, questioning the practical value in "obtaining reliable information from those being interrogated" and warning that service members who engaged in the techniques "would be at substantial risk of prosecution." He retired from the Army in October 2005 and, in 2007, became Dean of the Washburn University School of Law in Topeka, Kansas. Does the doctrine of the US military permit degrading, abusive or humiliating treatment? It didn't, it shouldn't, and if they've gone to that, then we have a problem. It did not allow that. It did not allow that. We trained our troops to treat everybody by the Geneva Convention because particularly when you capture somebody you don't know what kind of -- whether it's a lawful -- unlawful combatant -- a civilian. So you treat everybody consistent with the Geneva Convention, and -- and then consistent with that if you have an issue you do an Article 5 Tribunal and determine their status. So at the very minimum would have been Common Article 3 but really we treated people at a higher level than Common Article 3. We had Article 5 Tribunals in Vietnam, and there was a very short manual on how to do it. The Geneva Convention really doesn't tell you what the composition should be, but based on our customs and the way we had done things, we knew what we needed to do. You'd have a JAG involved, you'd have a line officer the -- the individual would be allowed to present information, they'd present information from the capture tags, other things like that. And then they'd make a determination. Does this person deserve the status? And then the treatment would follow. But even if they didn't deserve the protections -- or I mean, the status under the Geneva Convention as a prisoner of war, assume they're an unlawful combatant, that still didn't mean you could abuse them. That's when Common Article 3 kicked in and you still treated them humanely. Common Article 3 of the Geneva Convention lays out, basically says there is a due process minimum treatment level that all people should be treated. You don't abuse them, you don't mistreat them, you don't torture them, obviously. They call it Common Article 3 because it's found in all four of the Geneva Conventions and it talks about the conflicts of a non-international character. And it was an attempt by the drafters of the Geneva Convention to establish a baseline that nobody went below, because the Geneva Conventions are written by parties for international armed conflicts. So this level was to be underneath that as the absolute baseline. And the US military had abided by that for 50 years? Absolutely. We had always trained to treat people consistent under the Geneva Convention, because you don't know when you capture somebody what their status is going to be. So, yes, so we trained that, I had a discussion my last meeting that I went to before I retired. This very issue came up and the issue was: Was the Department of Defense -- what standard were they going to use for treatment of detainees? Were they going to adopt Common Article 3? And I advocated for that, and said that very thing, we have always trained to that standard, we are signatories of Geneva Convention, let's stand up and take credit for what we do. And when that meeting concluded the individual that was in charge, the deputy secretary of defense, was going forward with that position. Now I understand that got kicked back in the Vice President's office. I want to back up and sort of go through a couple of big decisions that took, if I may say it this way, traditional policy off track. The president's military order in November of 2001, set up military commissions, first mentioned enemy combatants. Tell me about that. Well, let me give you a little background. In October of 2001, I had just assumed the position of Judge Advocate General. I was contacted on a weekend, Saturday, and an individual said, "Well, we're going to have to talk, can't do it on the phone. I want to meet with you." And basically the substance of the meeting was that the United States was looking at the option of going with military commissions, which we've done in the past. And recognizing the Army had done that in the past -- the Army and JAG Corps, we'd be the repository of information on it. We established a small group working on this. Colonel Larry Morris was -- was the individual in charge of that at the time. The group grew over time. And then in November of 2001, just before Veterans' Weekend I got a phone call from Jim Haynes and it was, "We have a small group working on a document. We would like for you to provide -- it can either be you or somebody else come up and review the documents. You can't take it out, can't copy it, but we would like your input." And I said, "Sure. Larry Morris is the individual who's been working on this and would like for him to come up and assist you on this." Larry came back to me -- it was either a Friday or a Saturday. Calls, says, "We have to talk." And we met in my basement and he basically laid out from memory this document that in a lot of ways resembled a document from 1942 in establishing the military commissions. And we were both very concerned because military law, just like law in other areas, had advanced significantly in 60 years, and we felt that if we're going to do military commissions it ought to reflect that progress in military law. And this document didn't. And the long and the short of it is we didn't know how quickly the timeline was. We didn't know it was coming out as quickly -- came out two days later, I think. We had hoped we could make a difference in changing a number of things in there. We didn't. I don't think they made any changes. Isn't this unusual that the JAGs and the TJAG are not allowed a copy of a document of such import? Well, I thought so but that wasn't the only time that that's happened. That happened several times after that. Your colleague at the time, Don Guter, has said that you were marginalized during this particular debate. Looking back on it, it almost appeared that they wanted to be able to check the block that we had checked with the military. But it almost sounded like the document was close to a final document when we were asked to take a look at it. And nobody was going to make any changes at that point, was the sense that we got. Were surprised when two days later the president signed it out? Very surprised. Very surprised. Now the process that occurred after that, one of the things was that the Secretary of Defense was going to publish procedures to implement the -- the presidential order. We worked very hard to try to get due process back into the procedures to bring it forward in time, so to speak to reflect the practice of military law. Now we were able to do some of that. Some of the things they were initially talking about were very draconian. Worse than what it ended up being? Oh, much worse, much worse. There were issues whether they were going to allow civilian counsel at all. I wrote a -- a memo that went -- went to Mr. Haynes and he -- he later told me that he showed it to Secretary Rumsfeld, laying out why we thought civilian counsel were important. We used them and allowed them in World War II in the military commissions, yet there was a very strong sentiment not to allow civilian counsel for the military commissions. There were issues about burden of proof, would it be beyond a reasonable doubt or would it be preponderance of the evidence, an administrative standard? And we all felt very strongly, that if it's going to be a criminal court, which obviously it was, it needed to be beyond a reasonable doubt. There were issues also about how many members of the panel did it take to convict, and then sentence to death. And we felt unanimous, and that has eventually been changed. But there were a number of issues like that that were up in the air. There were clearly those, some that we met with, that were advocating for a very summary procedure. What I learned was some of the people advocating didn't have an understanding of military law, and felt like the military process was that way anyway. So they thought, well, we'll turn it over to the military, and they'll run them in one side and out the other -- guilty. You talked about at least one conversation you had with John Yoo. Can you recount that to me? It was talking about the military commission process and basically things being said that -- well, you -- you all don't worry so much about the legal niceties. And then he mentioned what he liked was, it was the military commissions were used for -- in the Indian Wars. And the Indians were a stateless people like al Qaeda and it would be very much like that. And I had a number of reactions to that. One, that was a hundred and fifty years before and my gosh, law has evolved tremendously since that time. The other thing was that the Native Americans would have taken umbrage at that because we had treaties saying that they were nations, nations under the United States obviously. But they had a level of sovereignty that we as a nation recognized. After the president's military order and setting up the military commissions, another big decision was opting out of the Geneva Conventions. We were never consulted. We were never consulted on that. That was a shock because there were many of us that felt very strongly that the Taliban should have had the presumption of being lawful combatants. They were the military of a government that was a signatory to the Geneva Convention. They had a chain of command. Clearly, they had that. So it was one of those things that we should have given them under Article 5 Tribunal if there was a question, but the presumption should have been they had Geneva Convention status to start out with. How did you find out that the United States was opting out of the Geneva Convention? Heard it on the news like everybody else. It was, it was interesting. It was one of those things that you would have thought we would have been at least engaged in a discussion. Now, maybe there were discussions at the Joint Chiefs level. I'm not aware of them. We weren't brought into that. And obviously the State Department would have been a big player in that, I would have thought. But no, we were not brought in; we were just told. What are the implications for our own military? Looking at it from two sides of the coin, how are our folks going to be treated if we have a country that just decides well, because you've done this and this and this, we're not going to give you status under the Geneva Convention. It's a dangerous precedent is what I'm saying. But the other thing that troubled me was, I think it fostered an environment that the rules are different now. And in the mind of people in the field, if the rules become fuzzy, then you have a very dangerous situation. And I think this was just one of a number of things that contributed to an atmosphere. Clearly, it didn't affect a lot of people. They knew what the rules were and all this didn't change anything, but I think there were those that it did confuse, and unfortunately probably a lot of those in the interrogation business where if you don't have bright lines, then it becomes a very slippery slope. And that's exactly the point -- that commanders in the field rely on the Geneva Conventions as well. In combat there's obviously such emotion. If you don't have strong bright-line rules then it, as I said, becomes a very slippery slope where bad things can happen because we're not as a disciplined a force as we should be. And it really does go to discipline. You know, a fighting force must be a disciplined focused force to be effective. And if some of the rules that help you bring discipline to that force have been fuzzied, then you're going to have problems. Talking about the Military Order, there were a number of things in there -- the format of the Commissions, calling people enemy combatants -- it's not a legal term. Anybody on the battlefield fighting you is an enemy combatant. They may have status or they may not have status. So there were a lot of things in that that could have been done so much better had they brought in the experts to help craft something that would have been more reflective of the United States' position in the world, vis-à-vis the Geneva Conventions, the law, plus our military practice of law. It would have been more reflective had we been brought in the processes and procedures we have today in the military justice system. Obviously there are going to be some differences for military commissions. You don't have the ability to capture evidence on the battlefield like you do at a crime scene. So you have to make some adjustments. But we didn't even go there. We just set up this thing that was the World War II model and tried to go from that. The defense for some of these decisions is that one has to understand the times, that the US had been attacked, that the people in positions of responsibility were terrified that we were going to be attacked again. How do you react to that defense? Well, first off, lawyers are the ones that need to be called in the eye of the storm and advising their clients on what the legal parameters are, and not allow as passion to get involved in providing -- in other words, don't politicize the legal advice. We've had these situations before after other events that have occurred to the United States, and we didn't throw everything out the window. There were a number of things that people were ready to jettison because these were different times. But that's a dangerous thing because, then you can, always have the excuse to jettison the law, the procedures, the due process, the conventions, whatever you want, when it's convenient. There was a lot of fear, there was a lot of emotion, but leaders need to be the ones that don't allow the emotion to overtake their thought process and their decision-making. I saw some very senior people being very emotional and saying things about "taking the gloves off" and this kind of stuff -- are very dangerous things when they're talking around subordinates. Because that opens the door for all sorts of -- if you tell a subordinate, "okay, it's time to take the gloves off", what are you communicating? You're communicating you can do things you weren't allowed to do before. It was a very difficult time. That sort of replicated itself to a certain extent when I got on the job in 2001, because there were three out of the three general counsels that were very much in the mode of trying to reign back the JAGs. The one that wasn't was the Navy General Counsel, who took a much more, I thought, professional approach to his relationship with the -- with the uniform. The feeling was that the JAGs were too independent? Exactly. I had a conversation with the Army General Counsel when I had given advice to the chief of staff of the Army, and he accused me of not being a team player and loyal to him. And that night I pointed out that I had an obligation to give my independent advice. He said, "Well, you knew what my position was on that. You should have supported me." I said, "Well, I'm sorry. That's not the way it works." And at that point he announced that he was going to try to civilianize most of the Army JAG Corps, as one way to rein us in. And it was during a time when the Army was going through a process of trying to civilianize positions to free up slots, billets, for the combat services. And so he was going to offer up, I think it was a thousand positions in the Army JAG Corps. Fortunately I had the support of the chief of staff of the Army, and the vice chief of staff of the Army, and finally the -- the secretary kind of weighed in on it. But it was an attempt to reign in the independent advice of the JAG. The interrogation Working Group. I understand that by the time it was convened in early 2003, it followed some of the patterns that you've been observing. Exactly. We were under the direction of the Air Force General Counsel, who was leading the Working Group. We had people at lower levels doing the work -- majors and lieutenant colonels and even colonels, doing the work. And there was a clear intent to support what the administration wanted or what was perceived as the administration's desire on interrogation policies. Now, I have to be honest with you. The fact that we were having a discussion on how far you could push interrogation, I think, is a shame. We should as a country not be at that point, because as I said, it becomes a very slippery slope. Can we do this? Can we do that? There are a lot of ways that you could take existing tried and true techniques and violate the law if you apply them in an illegal fashion. And our interrogators had to walk a very fine line and have to know what the law is and what the bright line is and now if we start moving it, you've created a situation where there's a lot of confusion in the mind of the interrogators. And that's what we were essentially doing. We were being asked to look at a whole laundry list of things, some of which were clearly violations under the law of war, international law, and US law. How did you find out about this Working Group? It's interesting. I was at a meeting, and DOD -- they were good about having us meet on a general basis with the general counsel and the TJAGs, and we'd meet and there wouldn't be a lot to talk about sometimes. Well, at this meeting Alberto Mora raised the issue of interrogation at Guantanamo. And he started talking about things that many of us weren't aware of, as far as things being done. And it caused the DOD General Counsel to say, "Well, we need to think and talk about it." And it was -- couple, three weeks later it was decided that there was going to be a working group put together under the auspices of the Air Force General Counsel, to look at this laundry list of techniques of interrogation that they wanted us to opine on, and whether they were legal or not legal. And what we discovered as we got into it, there was an underlying Office of Legal Counsel from the Justice Department opinion that was to be the legal basis for doing the things that they wanted to do in interrogation techniques. And it has subsequently been declassified, but at one point it was classified, and we were not allowed to have a copy of it or take notes on it. We could look at it, and it essentially laid out a theory that in time of war the president is not constrained by international law or domestic law in many ways -- and those underneath him who are following a policy consistent with this theory are immune from prosecution. Now we went back after looking at that, and said that there isn't a court internationally or in the United States that would support that theory. There isn't a military court that would buy that theory, that if you've committed an act of torture or war crime, but because you believe you are operating under the umbrella of a presidential war powers, the commander in chief war powers, you're immune. The commander in chief doesn't have the power to make that which is illegal under the law of war, legal. The top lawyers in the military are not allowed a copy of this document that they've been told is the governing authority, essentially. And we were told over and over again we were not to question the OLC opinion, because that was the position of the United States. The Office of Legal Counsel advises the United States and the Justice Department on the law, and if they render an opinion, that's the law. Well, I'm sorry, if it's illegal, it's illegal. And that's what we said. This memo or the legal opinion was arguing that even things that were illegal were legal if the president ordered them. Right. And more importantly, the individuals would be immune from prosecution. And you all didn't buy that? Because it's not true. There isn't, as I said, there isn't a court in the land or internationally that would buy that argument. The defense of superior orders when they're illegal has never been allowed. We validated that issue in World War II in the military commissions. When somebody says, "Well, I was under orders to do it," well, I'm sorry, you should have known the orders were illegal. And we did prosecute a number of people for that. One of the memos from one of your colleagues says that the Department of Justice doesn't represent the military and so he sort of almost regretfully says, "OLC does not represent the services, thus concern for service members is not reflected in their opinion." Oh, absolutely. And I mention it in mine, too, that what we've done is we've set a standard that we don't want applied to our own service members if they're captured. And often that's not thought of. But I will tell you, commanders think of that every day, and their lawyers think of that every day. What is the standard that we would expect our people to be treated if they're captured? You argued that service members who engaged in some of the interrogation techniques would be at substantial risk of prosecution. Absolutely. As I've said, I don't think there is a court anywhere that would buy the argument that they are immune from prosecution because the president has decided that certain laws no longer are applicable, certain treatment standards are no longer applicable. What we're talking about are significant things, not minor things under the Geneva Convention. You know, did we pay them so much a day, or did they get a care package, or those sorts of things. What we're talking about is humane treatment of prisoners. And that was the whole purpose of the Working Group was to figure out what we can do, what is humane. And it's pretty clear what humane treatment is. Another of your colleagues in one of these memos argued that many of the tactics that you were being asked to consider amounted to, to quote him, "assault." Assault, clearly. Some of them were torture. Waterboarding is torture. Any time you suffocate somebody, you inflict pain and torture on them, that is pain and suffering, that is torture. And those are the kinds of things we're looking at. That was on the list. Again another memo recommends that, quote, "We consider asking the decision makers directly, is this the right thing for US Military personnel?" My question to you is, were you able to ask the decision makers directly? Well, the question is, who was the decision maker on this? We only had one conversation with Mr. Rumsfeld, and that was right at the beginning. Looking back on it, it was interesting. He came in when the group that was going to be the Working Group was meeting and gave us a pep talk. And basically said this is so important, and what you're doing will affect the United States for years to come. And it was, I thought it a little strange that we were getting a pep talk on something like this. I guess one, looking back on it, could say, well, maybe it was an attempt to get us to do what they wanted to do politically. That's the only time we had a conversation that I was present at, and, assuming he was the decision maker. My supposition is that they took into account some of our concerns -- at least at the time I thought that. I never did see a final document produced by the Working Group. I thought it had just been put on the shelf. I learned about two, two and a half years later, that there was a final document. The group thought that they had listened to you and that the Working Group kind of went away? Exactly. That was what I was told, that, you know, we're not going to go forward on it, everything's on hold, that you've been listened to, and -- and many of those techniques that were at the extreme end are -- are now out the window. And so we kind of went on to do other things and thought it was over. As I said, there was a final product, as I later learned, that was put together. What were the circumstances when you learned that there was a final product? It may have been at a hearing on the Hill when I learned that there was a final product. I remember my fellow TJAGs all kind of -- we kind of looked at each other and went, really? So how does that happen? How does a document that you've all been pulled in to work on, you've mounted this pretty passionate protest against it. You're the top military lawyers in the system -- in the Pentagon, and something is secretly signed out, and you're not told about it? I don't know. That was sort of indicative of some of the things that occurred while we were there. There wasn't a great deal of respect for the uniformed JAGs, the TJAGs in the sense -- there was lip service to it, but in certainly the way we were treated at times, we were cut out of things, issues particularly early on, we were not operational things we were just totally cut out. So that what had been authorized for the CIA, for the other government agencies, was now moving over into the military? Yeah, yeah. That's always a problem. You know, as a nation there should be one standard that you adhere to. But assuming you are able to nuance things a little more with a smaller group like the CIA, I could see how, again, not that which is illegal, but they might have some techniques that will be different than the military because the military's a very large organization with lots of people doing a lot of different things, and you want a very bright line there. You do want it with the CIA, too, but as I said, there might be some nuance techniques that they can engage in. But it's always dangerous when one moves to the other side, because they don't have the same kind of background a lot of times. And obviously that happened. The point is, you can never do that which is illegal. But the military established interrogation techniques that could be applied in lots of situations by lots of different people. Hopefully they've had a lot of training. But sometimes that's not always the case. But it's a bright-line rule. CIA operates with people probably with a lot more experience, one would hope, in some things. That may not be the case. You're saying that there are extraordinary moments and cases. It's one of those things where, you don't like to talk a lot about because then it, again, causes an atmosphere that other people say, well, I can make that decision. But, having said that, assuming there are those situations, you don't want to apply that across a military organization of a million or more when you consider all services. And that's what seemed like happened a little bit, that there was this migrating of attitudes, and in some cases, techniques to a very large organization that had always had a bright-line rule, and it trained to a standard. And now we had an atmosphere where there was confusion. In the months after this Working Group report is put out secretly, we now know some of the worst abuses happened at various places. There were a number of problems. We moved interrogators around. We moved people that handled detainees around from Guantanamo to Afghanistan to Iraq. And I think it's safe to say that probably there was some migration of attitudes and techniques that had been allowed in one area or at least had been done in one area to another area. Clearly in Iraq the Geneva Conventions applied. Even the administration said the Geneva Conventions applied. So for us to be engaging in techniques that we said were okay in Guantanamo, but now it's being done in a Geneva Convention environment, created some issues, I think. By and large, most of our people didn't engage in that. They knew what they were doing. They knew they had been trained. They knew what the right things were. But there were -- on the edges, I think, there was some confusion in some people's minds. And you saw that in attempts to write interrogation policies for various units in various areas. So, it's unfortunate. One person has said to me, it is because of the training and the core of the military that what has happened wasn't, in fact, more widespread. I think that's probably true. I think the vast majority of our soldiers knew what was the right thing to do. And unfortunately in combat I'd mentioned earlier that the emotion and the passion and all of that that occurs that causes people to react in a violent way to situations. The danger has always been -- and in training troops is -- at the point of capture till they get them to a holding area. You need to make sure that that emotion doesn't cross over into the treatment of the detainees. I think we still do a pretty good job at that. That occurs sometimes but then at the -- the interrogation, that's a much different issue than the -- the point of capture treatment. If an enemy of the United States captured US personnel and interrogated them using some combination of the kinds of tactics that we now know have been used -- stress positions, hypothermia, threats, sleep and sensory deprivation -- would our troops have been subjected to torture or cruel treatment as prohibited by the Geneva Conventions? Certainly sounds like it. You know, you -- you'd have to know exactly what was done because, as I said you could take lawful techniques and apply them in a way that is illegal. Just the names you've used sound like they would be, but I would need to know more to be able to say, "Why, absolutely, we would -- we would prosecute these because these are crimes." But, now, if you said waterboarding, I don't think there's -- I don't see any way you can do waterboarding and say, "Well, that's a legal technique." The United States had always taken the high road and set the standard internationally on treatment. There had never been any doubt. We had always set the standard. And now the danger is there's going to be a perception that, "Well, the United States doesn't live to that standard -- why should we?" Are we safer, more secure as a result of these policies? I don't know how you could say we're safer and more secure. If you torture somebody, they'll tell you anything. I don't know anybody that is good at interrogation, has done it a lot, that will say that that's an effective means of getting information. Early in my career, before I became a lawyer, I was an intelligence officer. I ran a group of people, an office of interrogators. And we talked about this issue and they thought torture was never effective. They didn't talk about it because they contemplated it. They just talked about what they saw. This was during the Vietnam War, what the Vietnamese did. So I don't think it's effective. To that extent I don't see how it's made it safer. It has not made it safer for our soldiers when they're captured. Now the argument always is, "Well, the bad guys aren't going to treat our guys well anyway." That has always been an argument historically, that, you know, we always treat people better. But it gives us a position then to advocate a higher standard for our treatment. I think we saw some improvements in Vietnam, although those that were prisoners might not agree with that. But there was some improvement when the world focused on what was going on. It's hard to focus on what's going on in the way of treatment if we're doing the same thing. So, given the situation, and what we know, what we've heard from people who've been released how do you think how do you think history will judge this moment? Well, as far as how we've handled the treatment of detainees and the application of law in this area, it's not our shining moment. It is not something that I think history will be kind to us about. Now, it may be that soon things will be done to correct all of this, and perhaps it will be forgotten about. I doubt if it will ever be forgotten about. But we may be treated in a much less harsh light if actions are taken to correct the things that have been done and the perceptions that have been allowed to be out there. This idea that, "Well, I'm not sure waterboarding is a problem or is a crime -- oh, it bothers me personally, but I don't know if it's a crime." I think we need to be a little more aggressive on these kinds of things and draw where the line is and say absolutely, absolutely it's a crime. Your question about how we'll be treated by history -- I think it will be one of those things that the historians are going to say, "How did we get there? How did this happen?" This is not the standard that the United States has applied in the past, and hopefully it will be viewed as an aberration that is very quickly corrected. But it is not something that we can really be proud of.